Well I finally got the finishing touches done and here is the final result. A blissfull moment here… Took my measurments for the rails on the face frame they were all cut the same and they fit perfect. This pic shows the before they were glued and a few 23ga brads. Sanding before assembly sure makes life easier. This pic shows the crown moulding installed with built up bracing that will give it the strength needed. Several screw were put on the backside of the crown. 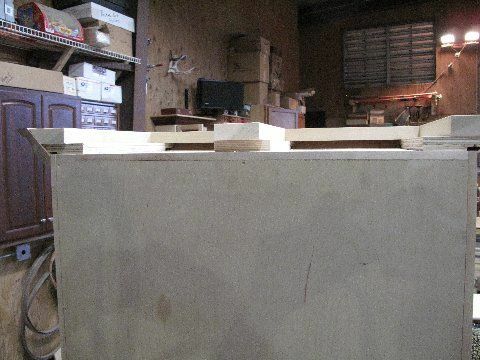 All Pieces were screwed down and glued as well….. Making good marks where all the screws went for future reference. Here is the top secured to the bracing and the so called cleat in place. 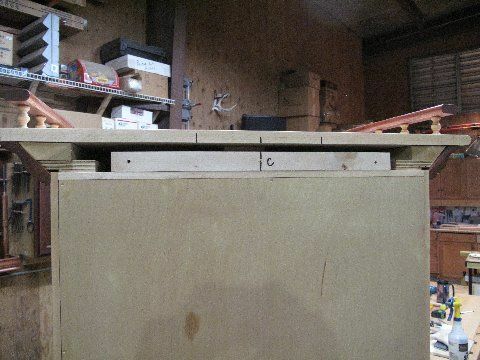 There will be 3 deck screws holding the cleat to the wall and 2 screws from the cabinet to the cleat on top. Button plugs will just be in place so they can be removed to take it down if needed. The cleat is hard maple 16 o.c. and measures 1 1/4×1 1/2×19 inches. 3 in deck screws will do the job. Touch up sanding, 3 coats of Danish Oil inside and out. The panels had 3 coats of d.o. before they were put together. The one more after final assembly. The jury is still out on the door handles, which may be changed out later. 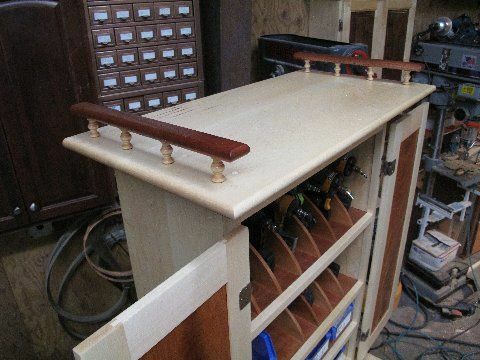 Now every gun has it’s place and all the brads/stapes have a new home. And still room for a few more… Notice the Bins are clearly marked….. Instead of cutting paper to slide in the little slots I used 1/8 Dry ease board. A touch of super glue will keep them secured to the bins. Now they can be marked and remarked when needed. After a few days the Dry ease marks will be a lot harder to rub off but with a little window cleaner they are good as new again. Had to throw this in, Q.C. looking somewhat confused over me taking the final picture of the top. 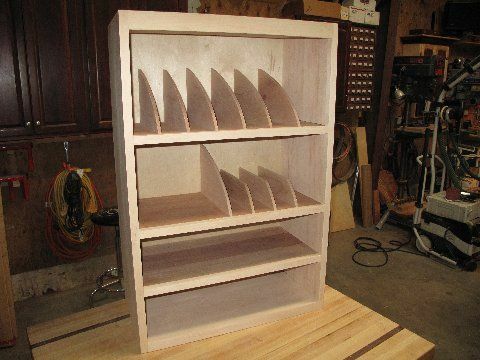 On this cabinet I thought I would add some side rails to keep anything from sliding off the sides. The top was secured with screws,then plugged. 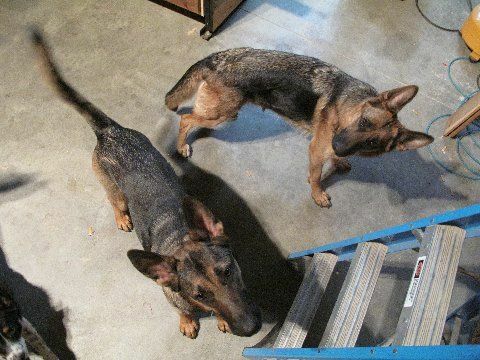 Knowing where all the screws went into the bracing is a big plus….. Trust me on this one. Beautiful work! 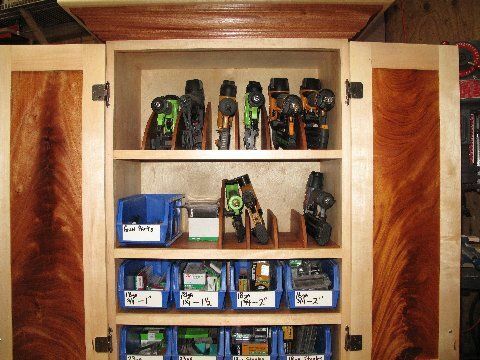 I absolutely think that is awesome that you made such a great cabinet for your nail guns! You do wonderful and amazing work. Thank you for sharing! 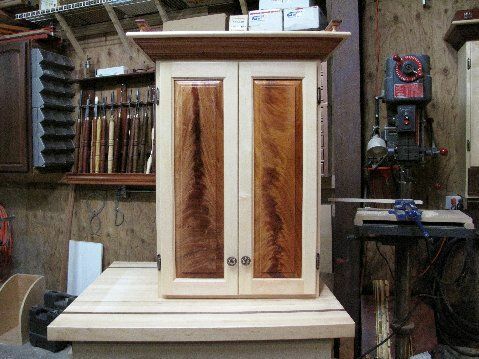 Great looking cabinet, you must really love your nail guns to lavish such a quality cabinet on them.